So you have decided that a 24 inch snow blower is the best size for you. Your driveway is about 2 cars wide and less than 100 feet long. You looked at my article of the under $600 snow blowers and they just don’t have the features you want. 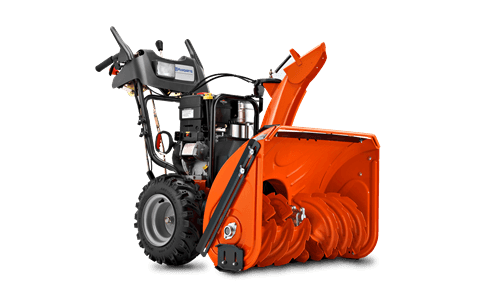 In this article I will go through the U.S. 24 inch snow blowers that sell for over $600 and give you the features and differences between them. I will give you my un-biased opinion on the snow blower based on repair history, service and features. If you want an in-depth review of a particular model look in the right-hand column and select my full review. I will tell you that if I could line up all the 24 inch snow blowers in a row and go over the features one-by-one most of you would buy a machine in this category. Those snow blowers have the most features that make your task easy, yet are affordable to buy and own. There are over 30 different models of 24 inch snow blowers. I have broken the model down to these groups: $600 and less, $600 and over. (Prices are listed prices on the retailer or manufacture websites. Actual price may vary. Data here is from manufacture’s websites.) All engines have electric start except as noted. All snow blowers have 4-way chute except as noted. The Best Value in this Group: Craftsman 88173. Best all around Snow blower: Ariens Compact Track 24 followed closely by Ariens Deluxe ST24LE, Cub Cadet 524SWE and Toro 724 OE. If you didn’t know, John Deere is out of the walk behind snow blower business. Also, Snapper/Simplicity is transitioning to a dealer only product. They are pulling out of the big box stores but there are dealers selling them on the internet. It looks like Briggs will continue to sell at retailers but will primarily use the Murray name. You may also find 24 inch snowblowers with names like Poulan Pro (Husqvarna), Powerland (Chinese), and Power Smart (Chinese). There is not enough data on these product and their service network for me to recommend these snow blowers to anyone at this time. If you find a 24 inch snow blower brand not listed here leave a comment below and I’ll check the snow blower and manufacture out. Tires: 13×4 These tires are small compared to the others in this group. Optional Warranty/Protection Plan: 3 or 5 yrs with in-home service. My Opinion: For many of you this is the machine that will get the job done. It is a great value for the price. It will work well for your driveway and sidewalks. It comes with the non-marring poly skid shoes but it does lack some major features that others in this price group have. It has small tires and does not have a 4-way chute. The chute is also a “hanging chute” and will not freeze up like the older chutes that rest on the impeller housing. The tires are better than those in the Under $600 range but you will find them lacking if you want to go off hard surfaces to blow snow. The 88173 through Sears also has the best protection plan of all the 24 inch snow blowers sold. Why? because it includes wear and tear, in-home service and fuel related problems. For around $250 you can purchase with the machine a program that will keep the machine trouble free for 5 years! It won’t start next fall, it has a flat tire, you use it enough that you wear out the belts, you ignore it and a bearing or transmission part goes bad, that is all covered. And you never have to take it anywhere. Just call 1-800-4MY-HOME and the tech comes right to your home and repairs the snow blower. Sold By: Home Depot, Tractor Supply and Servicing Dealers. My Opinion: The 524 SWE is is the lowest priced 24 in snow blower with power steering. 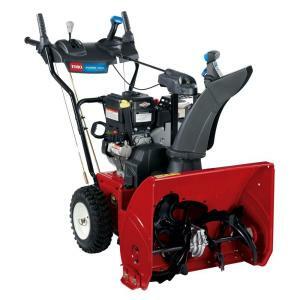 This snow blower is a good value because it has all the features and power steering! If you are small and have a hard time using a snow blower this is one to seriously look at. By just pulling on the handle mounted triggers this snow blower turns itself. It has larger tires than the Craftsman 88173 making it a good choice for many people. The 524 WE is the same machine without power steering. Sold By: Amazon.com and Servicing Dealers. My Opinion: This is my personal favorite of the machines listed here. Why? The fit and finish is great. New high intensity LED lighting, wrap around handles, huge tires, all make this one of the best values in the 24 in size. I have a great local dealer who is second to none in service after the sale. I not only clear my driveway, but I also clear a large spot out in the backyard for my dogs. The Husqvarna 924HV has the largest tires and it will easily clear snow off my lawn. I also like the wrap around handles. If you have ever been trying to maneuver in close quarters and gotten your coat caught in the handles you will understand why wrap around handles are great! My Opinion: The Simplicity and Snapper are different than the other brands. They have a lower intake height, all steel construction and only use Briggs & Stratton engines. They are good dependable machines but I feel the retail price is too high for what you get. The quality and features are comparable to the $679 Craftsman 888173 listed above. If your local dealer sells these for less than the retail price don’t be afraid to buy one. My Opinion: Toro has finally gotten in the game with this snow blower. They have always had very high quality machines, but this is the first model in a long time specifically for the homeowner. When blowing heavy snow the patented snow metering system only allows so much snow into the impeller reducing plugging. Fit and finish is great. The 2 way chute is easy to operate and the deflector does not ride up like the MTD build machines. My Opinion: The Craftsman 88173 listed above at $679 is a better buy. 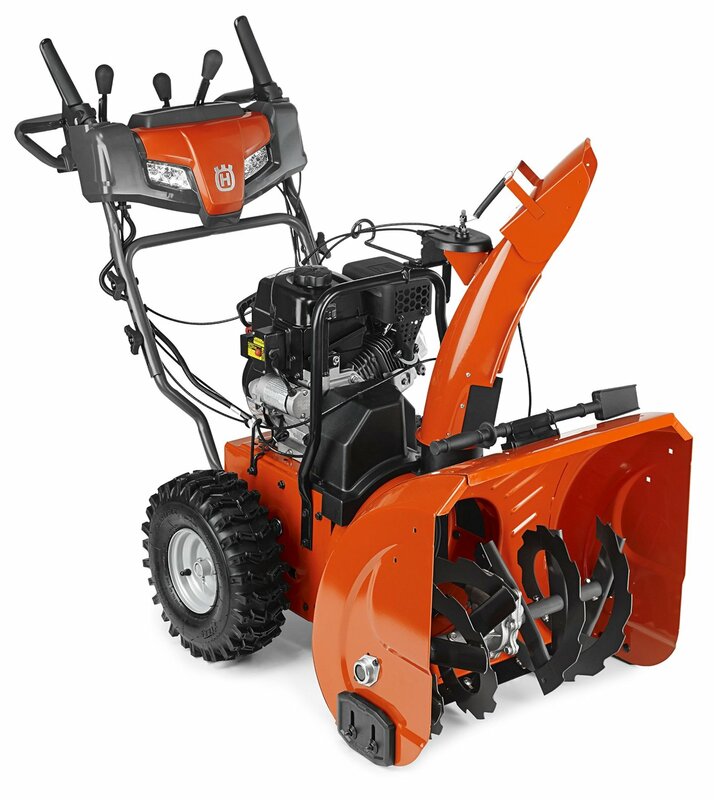 My Opinion: Don’t confuse this model with the Ariens Compact 24. 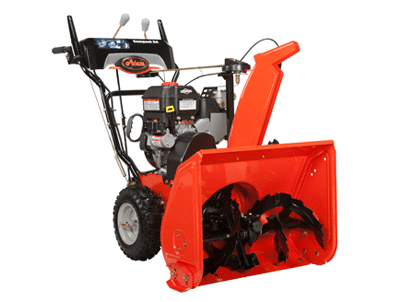 This high quality Ariens machine features one of the largest motors in the 24 in class. It has a 14 in impeller which is larger than all the other brands and will move more snow. 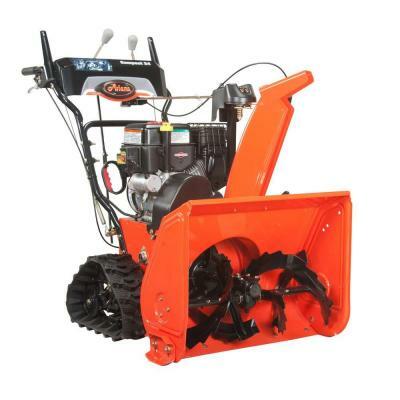 If you live in a snow belt, but have a small driveway this is the snow blower to buy. My Opinion: It’s simple, track drive models have more traction. They will push through heavy dense snow. They will bust through that snow plow drift at the end of your driveway. They will move on that soft gravel drive without tearing it up. Track drives are expensive but this one is worth every penny if you want the best traction in a small snow blower. My Opinion: This is one of the best 24 in snow blowers. Ariens does not use trigger controlled power steering, instead they use automatic traction control. This system automatically releases one wheel when you turn the snow blower. The larger 14 in impeller will throw snow farther than most of the other units. If you live in a snow belt and want all of the best features this is the machine for you! My Opinion: This is one of the best 24 in snow blowers. Trigger controlled power steering, hydrostatic drive, huge engine and hand warmers make this the best snow blower on the market. The high speed 14 in cast iron impeller will throw snow farther than most of the other units. If you live in a snow belt and want all of the best features this is the machine for you! Hi Paul I took your advice and got the Rapidtrak I have had it now for just over a week and got the chance to use it a couple of times it is one awesome machine I know that it will give me many years of great service. Thank you for your help in making the right decision. All the best. Southwest Wisconsin; double-wide driveway about 75′ long. The local small engine dealer / service shop features Simplicity. Local Sears appliance dealer promotes Husqvarna. Hi Bruce, If you don’t get deep drifts either the mid-priced Simplicity or the Husqvarna’s will work. DO NOT buy the ST320P, 30-inch Husqvarna. It has a habit of breaking the impeller belt on some of the heavier snows you can get. It really depends on the size you want. An Ariens Deluxe 24 ($999), Ariens Deluxe 28 SHO ($1299), Toro Power Max HD 928 ($1299) are the best choices depending on the size you need. You can get by with a Toro 826 OXE ($999) – it will get the job done but won’t be as fast. Hey Paul I am looking at getting a new snowblower I live in eastern Canada we get about 443 cm anually. I have a 7 hp Toro now and it is not doing the job for me my driveway is 20 feet wide by 100 feet long and I also have a gravel driveway next to that. I was looking at the Cub Cadet 2x 28 track or the Ariens Platinum sho track 28 just looking for some guidance on which way to go. There is a Ariens dealer close by but the Cub dealer is a 4 hour drive away. Thanks. Hi Wayne, 173 inches of snow is a lot! So, let me talk about your selections and 2 alternatives. 1. The Cub Cadet 2X 28 track is only designed for half the amount of snow you get. While it will have better traction it won’t clear snow any better/faster than the Toro. 2. The Ariens Platinum SHO Track 28 will do a much better job but it’s very hard to use. It’s slow like the Cub Cadet and very hard to turn. But, Ariens has a new track system, the Rapidtrak that is the best on the market. 3. The New Ariens Platinum SHO RapidTrak 28 is the best track system period. It’s fast, very easy to use and the 369cc engine is a good size for the amount of snow you get. It’s well worth the extra money over the Cub Cadet or the old Ariens Track. Check it out here: Ariens Platinum SHO RapidTrak 28. 4. If the RapidTrak is way out of your budget I would suggest the Arien Platinum 24 SHO or Arien Platinum 24 SHO EFI. 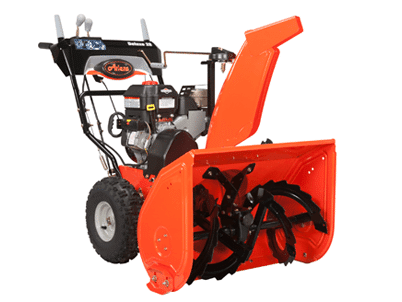 The Ariens Platinum Series is very well balanced which means it has great traction – even for a wheeled unit. The 24 inch will take you about 15 minutes or so longer to clear your driveway/gravel than the 28 inch. HI Paul, what is your opinion on the Cub Cadet 2X 930 SWE? Do Cub Cadets last long like the Ariens or similar models? I noticed that this appears to be discontinued? Is there a reason or did cub cadet prefer not to make 30 inch machines anymore. Your website is fantastic. Hi Nick, It’s on my “do not buy” list. It’s an old design and has always had a few issues. 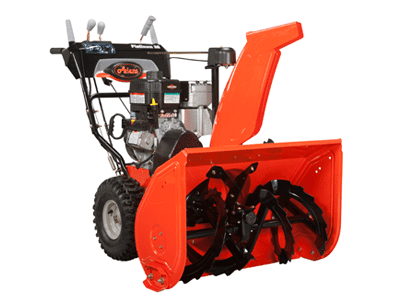 The only reason it’s still around is no one wants to buy the remaining few left in the warehouse….. No, that snow blower is not as heavy duty as an Ariens Deluxe/Platinum or Toro PowerMax HD. It’s been replaced with the 3X 30 HD. 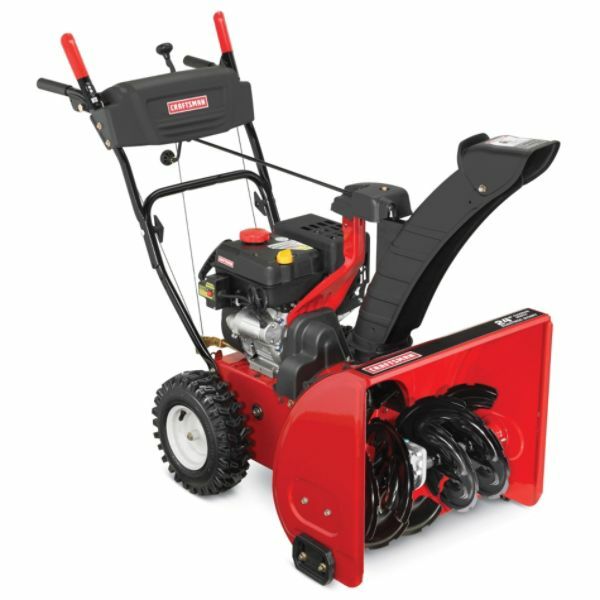 If you want an MTD heavy duty 2-stage look at the Troy-Bilt Arctic Storm. It’s a complete redesign and I like it. The new Arctic Storm will last. Hey Paul, thanks for creating an amazing resource for people like me who would have no idea if it weren’t for you. What a service to people in a cold climate! I’m trying to decide between the Toro 724 QXE ($750) vs Craftsman 26″ 208cc 88694 ($699 – on a black friday sale). Or something electric if they have any powerful enough to clear the snow plow pile? My driveway is paved and about 100feet x 1 car’s width on a mild incline. I live in Maine with 68″ of annual snowfall on average – though last year we had to create two levels for all the snow that piled up. A tough task with just shovels! Do either jump out at you as the better buy at these prices? Hi John, For you, the Toro 724 QXE is a good “second” snow blower. It’s fast and lightweight. But, it won’t handle deep, wet, heavy snows well – especially the heavy end-of-driveway stuff. With the amount of snow you usually get you won’t be happy with it a lot of the time. While the Toro does a good job of getting your snow off the driveway this Toro won’t throw snow as far as the Craftsman 2-stage snow blowers. The Craftsman 88694 is a good price but there is an even better deal hiding in the Sears Black Friday ad. From Thursday at 6 pm until Friday at 2 pm the Craftsman 88640 is on sale for $599 through sears.com or your local mall store. 24 inch, 208cc engine, power steering. I like the chute controls a lot better on it than the one on the 88694. So I suggest the 88640 or 88694 over the Toro for you. 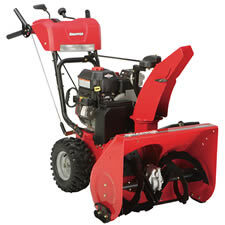 Paul, I live about 50 miles north of philly pa. I’ve been reading reviews for the last week, and so confused, they all seem to say that all snow blower are pretty good. I live in a town home community, where we need to clear out our parking spots and sidewalks. There are about 5-6 spot that need to be cleared and sidewalks. I’m looking into both the Husquavrna ST 224P and the Ariens Deluxe 24. Can you give some sound advice. Hi John, You are correct. Out of the 140 plus U.S. made snow blowers there are only four that are junk. The rest all will work for certain areas, size of your drive and types of snow. Hi. What are your thoughts on the MTD GOLD machines…specifically the LF704 26″. Thanks for being a great source of info! Hi Scott, It’s a decent residential grade snow blower. 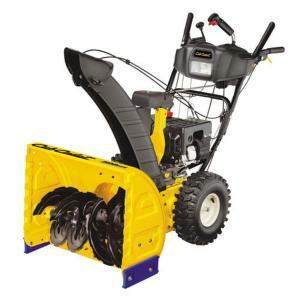 The MTD Gold brand is used in areas where there is also a Cub Cadet, Yard Machines, Troy-Bilt, Columbia dealer and another store wants to carry MTD snow blowers. The LF704 is similar to the Craftsman Quiet 208cc Dual-Stage Snowblower without the Quiet Engine. Sears has a better parts and repair network. If you are buying locally, that store also services their stuff and you are getting it for less than $750 then you’ll be fine. Otherwise I suggest the Craftsman.